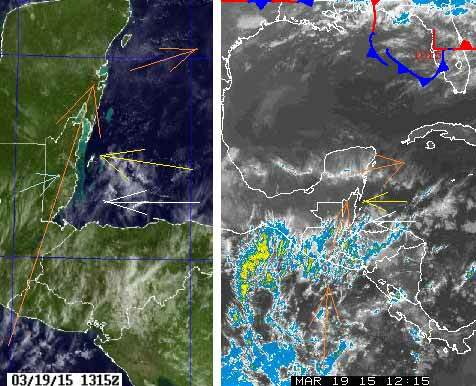 Belize NMS: Light and somewhat moist east-southeasterly airflow prevailing. 24-hour forecast: Partly cloudy tonight and sunny with cloudy spells tomorrow. Showers will be generally isolated. Today: Winds: E-SE 5-15 kts; seas: Choppy; waves: 2-3 ft; a few showers mainly northern and central areas. Tomorrow: Winds: East 5-15 kts; seas: Choppy; waves: 3-4 ft; isolated showers. Marine Outlook: Winds: East 5-15 kts; seas: Choppy; waves: 3-4 ft; isolated showers. The high level Pacific winds are streaming a lot of cloud our way this morning. It will probably have very little effect on our weather except reduce the sun brightness a bit. The Caribbean winds are more or less easterly, but they have patches of mid level cloud with it spreading out a bit, which could bring some scattered rain later today. I expect today will be largely sunny, perhaps a little cooler than some recent days, some cloud from time to time and a small possibility of some rain. 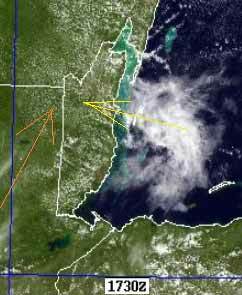 Quite possibly significant rain coming in with this cloud, in some parts of Belize.